USB Output: 1 x 5V DC 2A max; 2 x 5VDC 1A max. Charges and powers upto two electrical devices simultaneously. Low Power Consumption in standby mode. This Twin-USB adaptor is a very handy accessory to have in your home, office, study and will convert your mains power (100-240V AC) into two USB outlet (5V DC), charging and powering up to two electronic devices simultaneously. 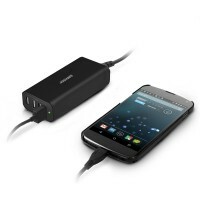 A compact and portable twin USB power adaptor perfect for travelling or at home or office use. Compatable with most electronic devices, including mobile phones, iPhones, iPad, MP3, MP4 players, digital cameras and portable games devices through the USB port. Works with most mobile phone models of Nokia Sony Ericsson Samsung LG Motorola. Works with Portable game devices digital devices MP3 MP4 PDA DC DV with a compatible 5V power connection.